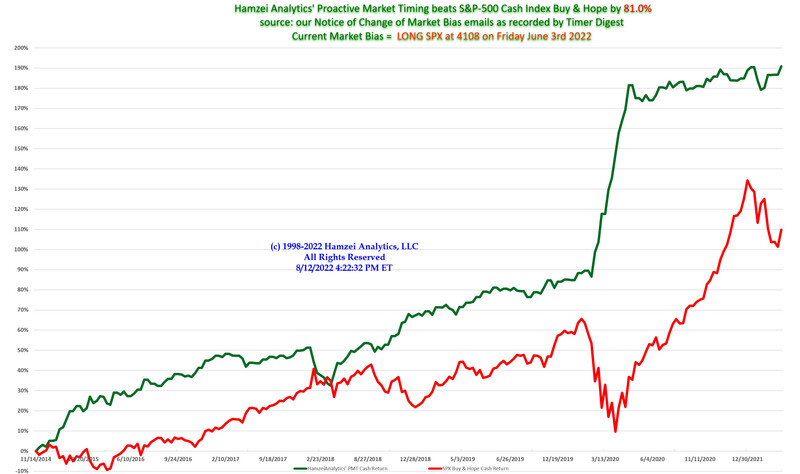 What is the Proactive Market Timing Pro Service? This package is specifically tailored for retail investors and professional money managers. It is NOT for daytraders. Fari Hamzei is the #1 Market Timer for the last Month, the last 3 Months, the last 3 Years, the last 5 Years, the last 8 Years as per Timer Digest. He is ranked #3 for the last year and the last 10 years. Each weekend you will receive a comprehensive review of US Equity Indices with the latest charts and detailed market commentary and exclusive analysis by Fari Hamzei. You will also get a copy of the "Notice to Change of Market Bias" email immediately after it is sent to Timer Digest*, with an explanation of why our bias has changed. You will also be notified 30 to 45 minutes before the Cash Close of our intention to change our Market Bias with Timer Digest. This is ideal for 401(k) account holders. Should the final settlement data for price(s), volume(s) and/or internals that gets posted after the Cash Close, present us with any unusual and/or compelling activities and/or warning, we reserve the right, that evening, to upgrade/enhance our prior intention with Timer Digest as stated earlier before the Cash Close. Every time there is any kind of change, you will get an email. To receive all alerts, updates and emails, be sure that Hamzei Analytics emails are "white listed" by your ISP. Free access to LIVE PMT Training Webinars with Fari Hamzei, including a 'Questions & Answers'** period afterward. This is a great opportunity to learn how to read the PMT charts & ask questions about specific indicators used. Free access to the Library of PMT Training Videos within the PMT Archives. This is an indispensable research tool! Ability to access and research all past PMT positions in the Archives. And, you will also get updated Timer Digest rankings as soon as they are available. This allows you to see how Hamzei Analytics faired against the competition. * Time Digest is an unbiased third party monitor who follows over 100 of the Nation's leading market timers and ranks them once per month. Timer Digest requires that we share every change of our market sentiment and they log and rank us against other market timers. ** There are restrictions on questions posed to Moderators. Questions must be market related and not request for advice on a particular stock. Who is Proactive Market Timing Pro designed for? It is NOT for day-traders. Will help you to better manage your retirement account and investment portfolio..
How Much does Proactive Market Timing Pro cost? Before we get started, please read this disclaimer.As you read, scroll all the way down and check the box indicated you have read the disclaimer. Hamzei Analytics, LLC, its owners, employees, agents, representatives, board members ("Hamzei Analytics") do not give individualized market advice thru the High Frequency Trading on Twitter Service. Due to the exclusive nature of our subscription service, your subscription fee is non-refundable. We publish information regarding trading suggestions in which we believe our readers may be interested and our reports reflect our sincere opinions. However, they are not intended to be personalized recommendations to buy, hold, or sell securities. Investments in the securities markets, and especially in options, are speculative and involve substantial risk. Only you can determine what level of risk is appropriate for you. We strongly advise you to consult with your broker, or, with your R.I.A. before acting on any of the trade suggestions issued thru the High Frequency Trading on Twitter Service. Prior to buying or selling an option, an investor must have a copy of Characteristics and Risks of Standardized Options. You can access and download the booklet on The Options Clearing Corporations' (OCC) website at http://www.theocc.com/about/publications/character-risks.jsp. This link reference is provided as a courtesy and does not imply that the OCC is endorsing Hamzei Analytics or its products. This booklet is also available for free from your broker or from any of the U.S. options exchanges. We encourage our readers to invest carefully and to utilize the information available at the web sites of the Securities and Exchange Commission at http://www.sec.gov and the National Association of Securities Dealers at http://www.FINRA.org. You can review public companies' filings at the SEC's EDGAR page. The NASD has published information on how to invest carefully at its web site. We encourage you to get personal advice from your professional investment advisor and to make independent investigations before acting on information that we publish. Most of our information is derived directly from information published by the companies on which we report and/or from other sources we believe are reliable, without our independent verification. Therefore, we cannot assure you that the information is accurate or complete. We do not, in any way, warrant or guarantee the success of any action which you take in reliance on our statements. Hamzei Analytics will limit the number of Subscribers allowed in any one trading service in order to reduce the risk that too many traders will attempt identical trades and influence the market by causing the purchase of an excessive number of contracts. Our personnel may own positions in the equities mentioned in our reports. However, all employees are prohibited from any transaction that directly or indirectly competes with the interests of our subscribers. We are not compensated in any way for publishing information about companies mentioned in our reports. Performance figures are based on actual recommendations made by Hamzei Analytics' Options Strategists. Due to the time critical nature of stock, options, brokerage fees, and the activity of other Subscribers, Hamzei Analytics cannot guarantee that Subscribers will mirror the exact performance stated on our track records or promotions. Performance numbers shown are based on trades Subscribers could enter based on our tracking guidelines. Past results are not necessarily indicative of future performance. Hamzei Analytics liability, whether in contract, tort, negligence, or otherwise, shall be limited in the aggregate to direct and actual damages not to exceed the fees received by Hamzei Analytics from Subscriber. Hamzei Analytics will not be liable for consequential, incidental, punitive, special, exemplary or indirect damages resulting directly, or indirectly, from the use of, or reliance upon, any material provided by Hamzei Analytics. Without limitation, Hamzei Analytics shall not be responsible or liable for any loss or damages related to, either directly or indirectly, (1) any decline in market value or loss of any investment; (2) a subscriber's inability to use or any delay in accessing Hamzei Analytics website or any other source of material provided by Hamzei Analytics; (3) any absence of material on Hamzei Analytics website; (4) Hamzei Analytics failure to deliver or delay in delivering any material; or (5) any kind of error in transmission of material. Hamzei Analytics and Subscriber acknowledge that, without limitation, the above-enumerated conditions cannot be the probable result of any breach of any agreement between Hamzei Analytics and Subscriber. ANY AND ALL MATERIAL PROVIDED BY HAMZEI ANALYTICS IS PROVIDED "AS IS" AND HAMZEI ANALYTICS MAKE NO WARRANTY OF ANY KIND, EXPRESS OR IMPLIED, INCLUDING, WITHOUT LIMITATION, ANY WARRANTIES OF MERCHANTABILITY OR FITNESS FOR A PARTICULAR PURPOSE. Notwithstanding any other agreement or other communications between Hamzei Analytics and Subscriber to the contrary, receipt or use of any material provided by Hamzei Analytics, at any time and through any means, whether directly or indirectly, represents acknowledgement by such person of this disclaimer and agreement with its terms and conditions. Hamzei Analytics make no representations or warranties about the accuracy or completeness of the information contained on this website. Any links provided to other server sites are offered as a matter of convenience and in no way are meant to imply that Hamzei Analytics endorse, sponsor, promote or is affiliated with the owners of, or participants, in those sites, or endorse any information contained on those sites, unless expressly stated. Hamzei Analytics is the copyright owner of all text and graphics contained on this website, except as otherwise indicated. Other parties' trademarks and service marks that may be referred to herein are the property of their respective owners. You may print a copy of the information contained herein for your personal use only, but you may not reproduce or distribute the text or graphics to others or substantially copy the information on your own server, or link to this website, without prior written permission of Hamzei Analytics. Permission to use and reproduce documents and related graphics available from this website is granted, provided that: 1. the below copyright notice appears in all copies and that both the copyright and this permission notice appear; 2. use and reproduction of documents and related graphics available from this website is limited to personal, non-commercial use; 3. no documents or related graphics, including logos, available from this website are modified in any way; and 4. no graphics, including logos, available from this website are used separate from accompanying text. Use or reproduction for any other purpose is expressly prohibited by law, and may result in civil and criminal penalties. Violators will be prosecuted to the maximum extent possible. By Checking this box, I agree that I have read and understand the disclaimer. Currently, we show you are not logged in. In order to subscribe to this service you must first login. If this is your first time here, please register. It's very simple. Please login to identify yourself. * if you have forgotten your password, you will need to reset your password and then you will need to start this process over again. for Express Registration Service & you can skip this step entering the information below! Once you sign into PayPal, you will be asked to verify the transaction. Upon Verification, The email address you have registered at PayPal will be sent to us and we will send you an email with your temporary password. You will also be logged into this site and You will have a final chance to review your order. ** We require strong passwords. Your password must be at least 8 charactors long. It must contain at least one upper case and at least one lower case letter. Already a Registered Hamzei Analytics User? Your Account has been Authenticated! It is passed through to our processor. Please Confirm Your Subscription before you place your Order. You should receive an email with your receipt. It is very important that we make sure you are receiving email from us. We send alerts with email and if you aren't receiving them, you will be behind. The main reason you haven't received an email is that it has been marked as SPAM. First thing, Check you BULK or SPAM folders. If it is in that folder, mark it as not spam and then mark it as "Preferred Sender". Different email application may have different names for this feature. Next, Check your Delete folder, Just in case. If you haven’t found it, it may be that your Internet Service Provider may have filtered your email. Please confirm with them that you want these emails so that you are always kept aware of our market alerts. PayPal has confirmed your identity. You have NOT been charged yet. One moment please, while we register your account with us. You should be receiving an email shortly to your PayPal registered email account. It will contain your new password. You will need to Change your password on your first login. PayPal has confirmed your identity and order. One moment please, while we are about to charge you and give you access. You should be receiving an email shortly to yourconfirming the purchase. © 1998 - 2019 - Hamzei Analytics, LLC All Rights Reserved.